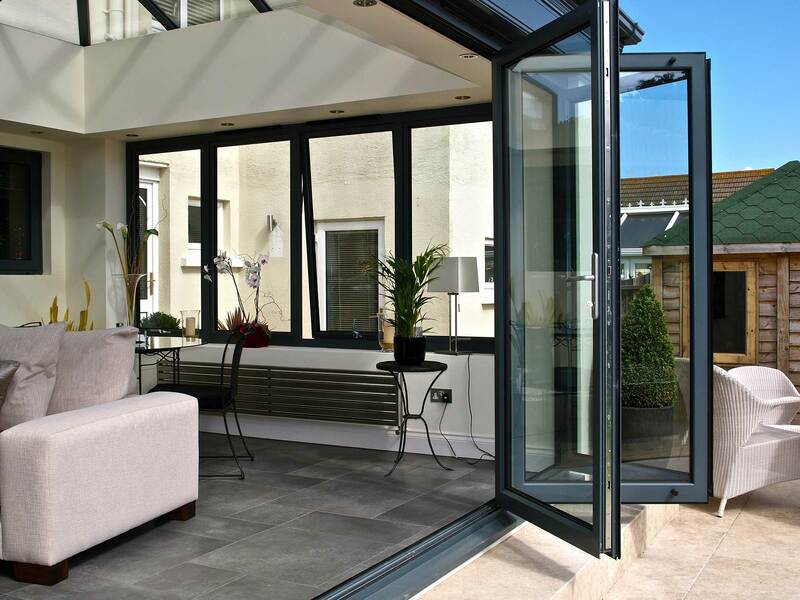 A stunning, practical bi-fold door solution offering high versatility. An intelligent combination of form and function, our highly versatile and market-leading bi-fold sliding door system gives you maximum control over the style and operation of the doors. Multiple panels can be added to accommodate the design specifications of your building, with the option to open in or out as required. The system also boasts a unique flush line pop-out handle that allows for square flush staking panels when the doors are fully open. Our ALUK BSF70 bi-folding doors are a welcoming, stunning and practical solution for a range of project types. Consisting of an intelligent combination of form and function, the versatile bi-fold sliding door system is customisable so that you gain a unique solution that is bespoke to your property. You can select the number of panels you want your bi-folding doors to consist of, dictating the measurements and size you require for the space they are being designed to fit within. There is the option to choose whether you want the doors to stack neatly to the side inside or outside of the property dependent on the amount of space available. The system features the ALUK flush line pop-out handle that allows for square flush stacking panels when the doors are fully open. The discreet and sleek hardware allows for a minimalist look and feel that seamlessly blends into a range of project styles. 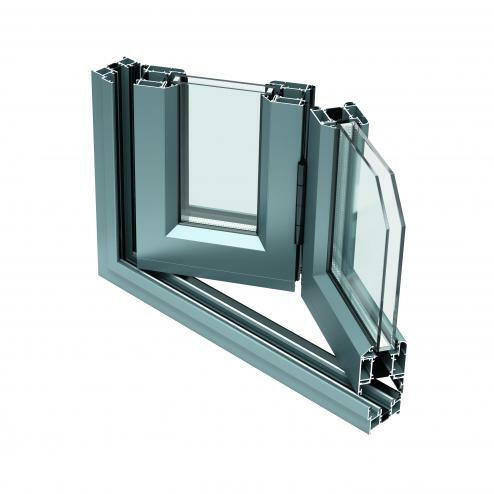 The narrow and slimline profile ensures that maximum glazing is achieved, flooding rooms and spaces with natural light even when they are closed. This means you can enjoy a bright and airy atmosphere at all times, from the comfort of your home. Take a virtual tour of our showroom and take a look at the products we have on show. To visit us in person, get in touch to arrange a viewing. You can watch our product videos to get a feel for the bi-folding doors we have available. See the smooth operation in action with the gliding opening and closing mechanism. Our ALUK BSF70 bi-folding doors are suitable for both residential and commercial applications, making them a versatile and customisable system that can be tailor made to your exact needs. 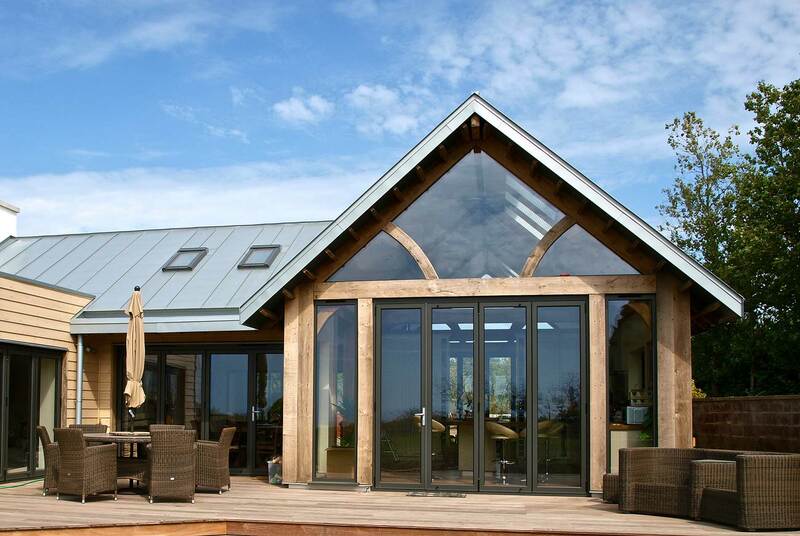 The integral strength of our bi-fold doors means that they can consist of larger glazed panels for stunning views and increased natural light. 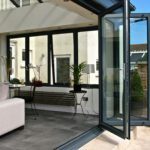 Available with a low threshold for easy access, our bi-fold doors offer a true extension of the interior of a property, making the outside feel connected. They are a multi-purpose door solution, helping to segregate rooms or provide an excellent entrance or exit point. Featuring solid stainless steel wheels, they have a smooth opening operation that is noiseless and requires minimal force. 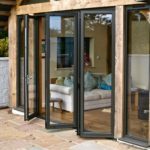 Open up your bi-fold doors in the warmer months to allow for increased ventilation and fresh air, close them in the colder months to benefit from increased insulation and energy conservation. Our ALUK BSF70 bi-fold doors are available with a polyester powder coating or an anodised finish in your RAL colour of choice. You can select from over 200 colours to create a unique solution that is bespoke to your property. Choose single or dual colour options to perfectly complement the interior and exterior of your project. View our brochures which contain technical specifications and information. You can get in touch with any questions or queries that you may have. Selecting the ALUK BSF70 bi-fold door opens up an endless amount of options and features to choose from to create the ideal door solution for your project. With a range of top quality and premium hardware, you can add the finishing touch to your bi-fold doors. Finish your bi-fold doors with a sleek and contemporary look by opting for pill handles that are discreet, modern and effective for space optimisation. These are a popular option for larger and commercial applications such as storeys of modern apartments or office blocks. For projects that require a more traditional approach you can select from a range of lever handles that are a timeless and classic design. Suitable for a range of styles of building, you can select hardware that is available in a variety of colours and styles to best suit your needs. With white gloss, anthracite grey matt and semi-gloss graphite black available as standard colours, our bi-fold doors exude elegance and modern luxury with a stunning and beautiful finish. Our colours are long-lasting, promising a luxe and opulent aesthetic. You can contact us today for a free quote for your front door today. Whether you’re looking for the ALUK BSF70 bi-fold door model to be implemented into a residential or commercial project, we can assist. Simply visit our contact page and fill out our online contact form. A member of our expert team will be able to answer any questions you may have. We are happy to recommend or advise on the most suitable products for your needs and requirements. Our doors simply open up in a concertina effect and stack neatly to the side either inside of the property or outside depending on the space you have available and your individual preference. They have a smooth gliding operation that makes them easy to use with minimal effort or force. 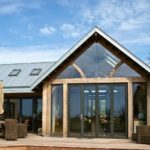 How to bi-fold doors differ from traditional sliding doors? 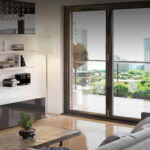 Bi-fold doors are a unique solution that differs from a traditional sliding door in the way that the functionality consists of panels that stack away neatly for a compact and space-saving solution. They allow for the entire wall of a building or property to be opened up to allow the outdoors to seamlessly connect with the inside. 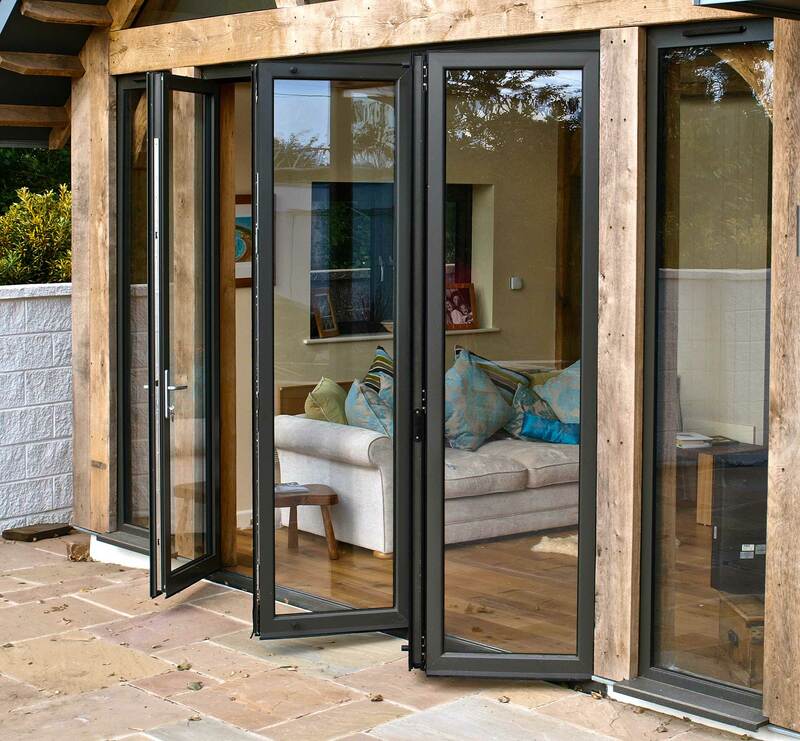 Our ALUK BSF70 bi-fold doors are incredibly watertight, keeping moisture out and warmth in. They offer excellent thermal efficiency and offer durability and long-lasting functionality. They are also very secure, giving you complete peace of mind about the protection of your home.